Reading played such a huge part of my life when I was growing up, yet since moving to University it has definitely lost it's leisurely tone. With the sheer volumes of reading I have to do on a daily basis (#artsstudentlife) I find that when I have free time I would rather spend it exercising, watching Netflix or simply napping. However this Christmas while shopping for my best friend's Christmas present I remembered that I had seen an advert for "Confessions of a Tinderella" a few months ago in a magazine and knew I simply had to get it for her. As someone who doesn't use Tinder myself I was so curious to read the book, so the second that my friend had finished I snatched it back and began to read for the first time in a long time simply for pure enjoyment. Not to give away too much of the plot, the book follows modern Bridget Jone's-esque Rosy Edwards as she battles through the single life in her 20's. 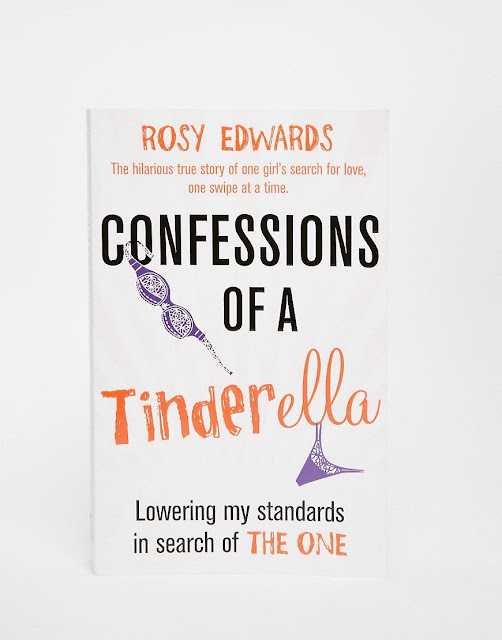 With most of her friends settling down and getting engaged, after being persuaded to download Tinder a hilarious string of dates ensues. While some of the dates fail due to simply having no chemistry, some are absolutely hilarious, it's hard to believe that some of those characters are real people! I honestly laughed out loud whilst reading, and it's light and chatty narrative enables you to fly through the chapters, always able to pick off from where you left off. Although I was slightly disappointed with the ending as it doesn't really tie up any loose ends, only really creates new ones I simply cannot recommend this book enough! For anyone who is single/taken/doesn't care it has something to make you laugh and it is the perfect gift for a friend too! What it also does, is leave you questioning how we think about love and dating today. We put so much pressure on ourselves to find "the one" that we even subject ourselves to shallow aesthetic judgement in the form of dating apps such as Tinder. Recently, I discovered that someone had set up a tinder profile using photographs downloaded from my Facebook account and I honestly felt sick. I am going to write a post about it soon as I think it is something that is so important to be aware of when putting both images and words out on the internet. You can never be sure of where they are going to end up and in what manner they may be manipulated. It's so sad that people still do not have the confidence within themselves to be comfortable enough in their own skin when creating profiles on dating sites like these and it's almost sadder that as a society we are allowing it to happen.